Vraisemblablement Votre Veloclub: Three Parks for Your Birthday! 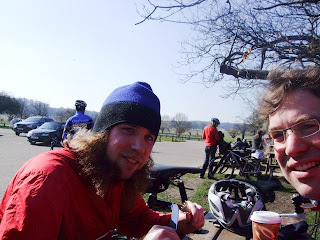 Today the nonworking members of the TroisV celebrated the anniversary of the birth of one of its members by gathering at the Meeting Point at 10:30 and riding a half-lap (which we completed on the way home) of Regent's Park before heading through London via Hyde Park to Richmond Park, where we rode a counterclockwise lap followed by a clockwise lap, and then, depending on who we were, ate a bacon sandwich or a baked potato smothered in cheese. We battled a faulty brake, a minor case of major calvescramping, a member of our archrivals, several incidents of idiotic driving and a difficult decision concerning which basin to use in the toilets. 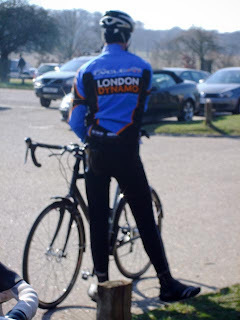 The ride was notable for being the first of the year without full winter layers. For the first time ever, we post the stats of our ride. Hooray! It occurs to me that I don't think that Matt is 16 mph faster than me (10 or 12, maybe). That 48 is buuuuullsheeeet.